M.Sc. ECE is a 2-year full-time postgraduate course in Electronics Engineering. The eligibility for which is B.Sc. ECE course with a minimum of 55% aggregate marks. Eligible candidates may apply for this course through online or offline. This course also introduces major concepts in electronics engineering in an integrated fashion. This course also helps to practice modern engineering tools to solve complex activities in engineering. Admission to M.Sc. ECE course may vary from one college to another. Government-based colleges conduct counseling for the students and select students based on the marks obtained in their bachelor examinations. Reputed colleges conduct entrance exams and select students based on the marks obtained in the entrance exam. Private colleges conduct the personal interview followed by the entrance exam. Students will be selected based on their performances in an entrance exam and the personal interview for course admission. After completing M.Sc. ECE course, graduates may get opportunities in areas such as Civil Aviation, Indian Telephone Industries, Railways, Telecommunication, Television Industry, Research, and Development, etc. These professionals may work in major positions like Service Engineer, Technical Director, Software Analyst, Network Planning Engineer, Electronics and Communication Consultant, etc. 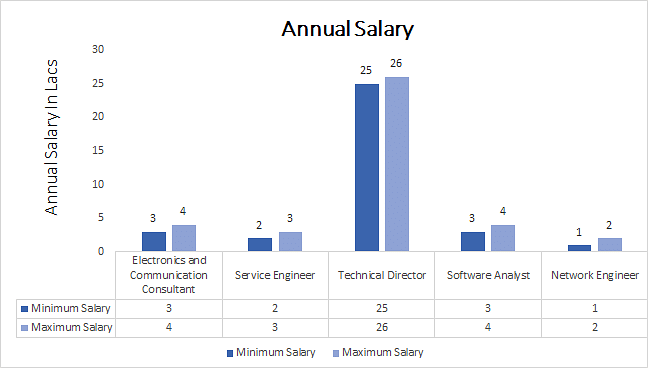 Professionals may get average salaries from the reputed organizations to range between INR 1 to 25 Lacs per annum. M.Sc. ECE: What is it About? M.Sc. ECE course, students study design, research, testing, and development of the electronic equipment used in various systems. This course deals with basic electronics, microprocessors, satellite communication, communications equipment, microwave engineering, analog integrated circuits, basic electronics and solid state devices. In M.Sc. ECE course, students gain a strong foundation in digital signal processing, electromagnetic theory, digital system design, electronic circuits, Analog communication, microprocessors and microcontrollers, microwave engineering, VLSI design, control engineering, and digital communication. They design and conduct experiments, interpret data, analyze, and combine information to provide certain conclusions for investigating problems. In this course, students study major topics are digital electronic circuits, electrical machines, engineering economics, electrical engineering, and semiconductor devices. Or any equivalent degree in a science stream from a recognized board are eligible for M.Sc. ECE course. Candidates should obtain 55% of marks in their bachelor degree examination for course eligibility. The percentage may vary from one college to another. Eligible candidates may apply for this course through online or offline. Candidates can fill the application form and apply for this course in the official website of the respective colleges and institutes. Candidates can get an application form directly from the admission office of the respective colleges. Entrance exams may vary from state to state. Private colleges conduct the personal interview followed by the entrance exam. Those colleges select students based on their performances in an entrance exam and the personal interview. M.Sc. ECE: Who should opt? Electronics and Communications field has lots of opportunities in India. After completion of M.Sc. ECE course, graduates may work in the Government sector, Enterprises and Departments like Defence Services, Colleges and Universities, Hardware Manufacturing Companies, Aviation Industry, Railways, Power Industry, Automobile Sector, Software Engineering Companies, Maintenance Sectors, and Civil Services. The private sector has even more job opportunities. Graduates may work in various positions in top companies include Technician, Junior Engineer, Scientist, Assistant Engineer, Engineering Executive, Senior Management Staff, Regulatory Officer, Assistant Chemist, Application Engineer, Trainee, Power Electronics Designer, Sales Engineer, Electrical engineer, Electronics engineer, etc. These professionals may also get opportunities in sectors like Industries involved in the manufacturing sector, Production and manufacturing, Electrical goods Telecommunications sector, Energy sector, and Private sector enterprises.